And the next time I open the app, there are all the ads that I paid to get rid of. Restore purchase of course didn’t work, and there is the debit, on my card 😡 Thankfully I can get my money back through iTunes for this, but I am going to report this as misrepresentation, false advertising, and basically theft. Also, a developer that forces people to give their piece of crap app five stars just to unlock pro features, and then, not unlike those features, that’s questionable business practices. You give the people the opportunity to to give an honest review of an iPhone app, and most people will do it without being promised that they will get free features if they give a five star review. That’s the same thing as rewarding kids in school for doing their work, that should not be the motivation for doing anything. Apps like this set a bad precedent in the Apple App Store. 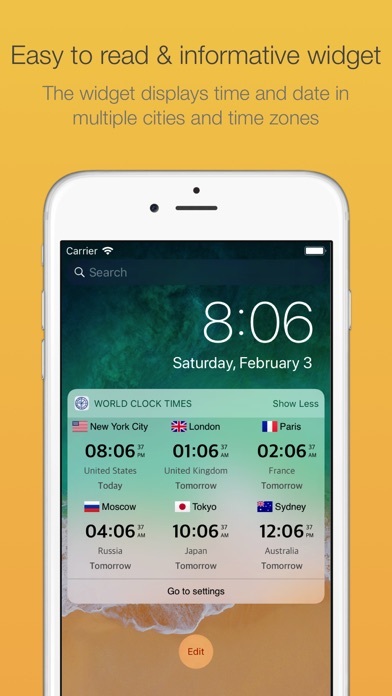 Why should we be forced to use Washington, New York, or Chicago in our widget? I don't mind paying $2.99 in app for at least 6 locations. But we should be able to delete the default locations, and choose 6 of our own. A choice of clock designs would be nice. Moving the order of the clocks would also be nice. 5 stars if we can choose our own 6 locations. 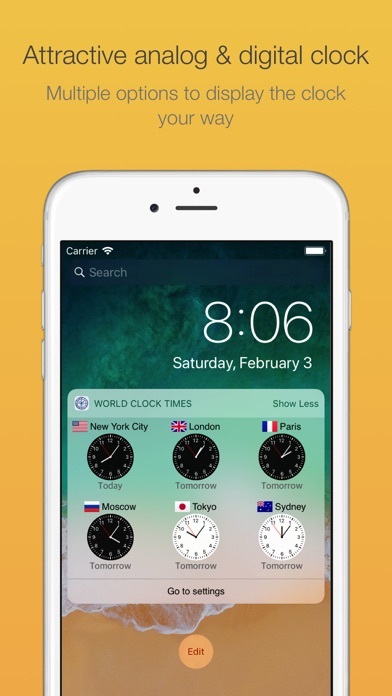 But why does it show Washington in the central time zone? Odd! Aggressive ads to apps not available in my country. The design overlaps iPhone XS Max horizontal bar at the bottom. It looks the app haven’t gotten enough thinking while being made. Deleted. Can not add places to main screen without having to buy upgrades. ...but still tries to charge additional for more than 2 cities. Deleted. 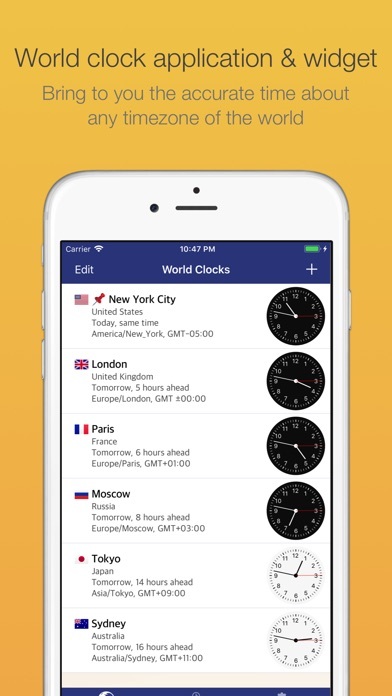 The widget display has no configuration ability, and on the iPhone clips off information. 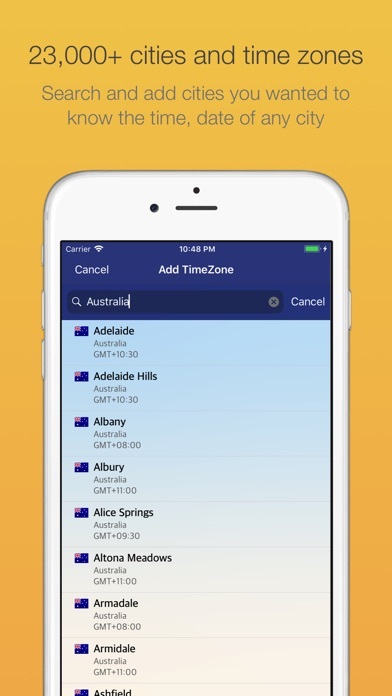 Also, cannot set the number of displayed cities in the widget. Otherwise a nice app. 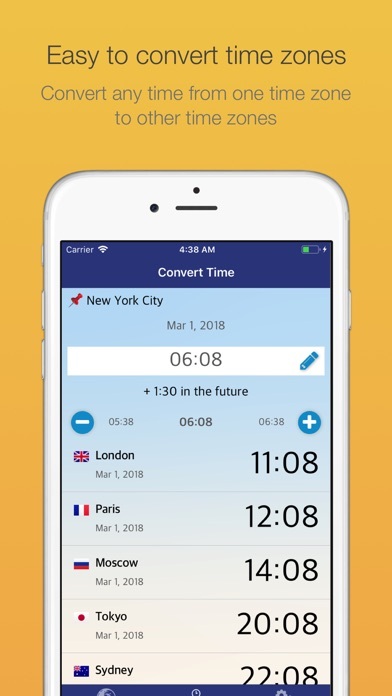 To have more than two time zones you have to pay an additional $2.99. Don’t bother! And that’s the paid version! Instant delete. Full of ads, doesn't work well. One add after another so you can't use it. And they seem to be "buying" good ratings by having people rate them 5 stars to unlock features. Avoid this app!